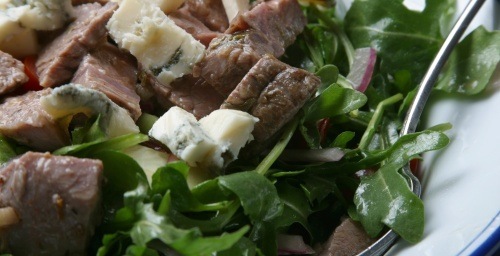 So what do you do with the leftovers from making an entire leg of lamb… Lamb salad! 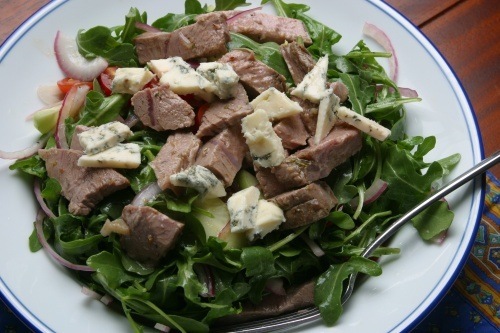 Lamb has a pretty strong flavor so you need a salad that can stand up to it. We went with Arugula for the greens. Spinach or perhaps something like mustard greens. We also added gorgonzola and red onions. We didn’t go for too complicated a dressing, I think it was a lemon vinaigrette made with lemon zest, lemon juice, olive oil and a sherry vinegar. The results were great! I definitely remember giving this a try. You could also probably swap the lamb for steak. Strong salads can support a strong topping!